Humble Bundle currently have a bundle of puzzle e-books available. Humble Bundle work on a “pay what you want, and you can choose to donate it to a charity of your choice” system; as far as I can tell, any charity with a UK charity number is eligible for your donation, though I like the look of the three defaults which are suggested. 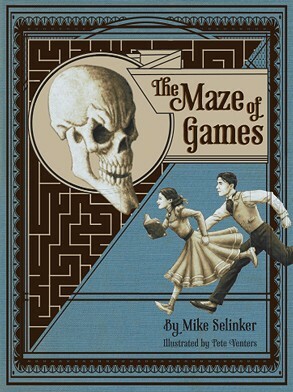 Pay/donate US$7 or more and you get eight more books in the same way for a total of fifteen, headlined by Dr. Thomas Snyder’s “The Art of Sudoku” and Mike Selinker’s “The Maze of Games”. Increase your payment/donation to US$15 and up for a total of twenty-one books plus the audiobook version of “The Maze of Games” and one more, containing puzzles pointing to hints to a super-meta for “The Maze of Games”, once it is written in a couple of months’ time. Increase your payment/donation to US$42 or more and US$25.01 of it will cover the cost of a hardback copy of “The Maze of Games”, but you have to pay shipping on top… and shipping a hardback book overseas is seriously expensive, raising the effective price past the GBP 50 mark. Being cynical to a fault, it looks like several of these books could not actually have previously been bought as dead-tree books (except possibly via print-on-demand services…?) and it’s possible that several of the puzzles may well have been published elsewhere previously, but you’re still getting an awful lot of high-quality puzzles for a remarkably low cost…. which could be entirely a charity donation if you wanted it to be one. The star attraction is probably “The Maze of Games”, and it’s likely that you might have backed it when the Kickstarter campaign was in progress. However, if you didn’t, you can get a wealth of wonderfully well-realised ideas at an extremely attractive price.